Stilton is made in Britain. Only six dairies in the world are licensed to make Stilton cheese, and they reside in the counties of Derbyshire, Leicestershire and Nottinghamshire. 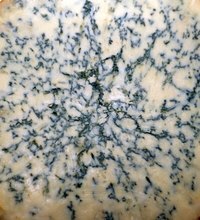 It is made in a way similar to its cousin, blue cheese, but no mold spores are added and it is sold at four weeks of age. It has a crumbly, yet creamy, texture and is a versatile cheese, used in both main dishes and desserts. Unlike many cheeses, Stilton may be frozen with excellent results as long as it is done properly. Slice the Stilton cheese into 6-oz. pieces. Wrap the pieces individually with several layers of clear plastic wrap. Wrap a double layer of aluminum foil over the plastic wrap. You can keep these pieces of cheese in the freezer for six to 10 weeks without loss of flavor.